The tenth live-action film in the epic sci-fi franchise (counting two Ewok television movies); and the first standalone 'STAR WARS' film, in a new planned anthology series. The story is set shortly before the events of 'A NEW HOPE'; and it revolves around the Rebel Alliance's attempts to steal the design schematics for the Death Star. 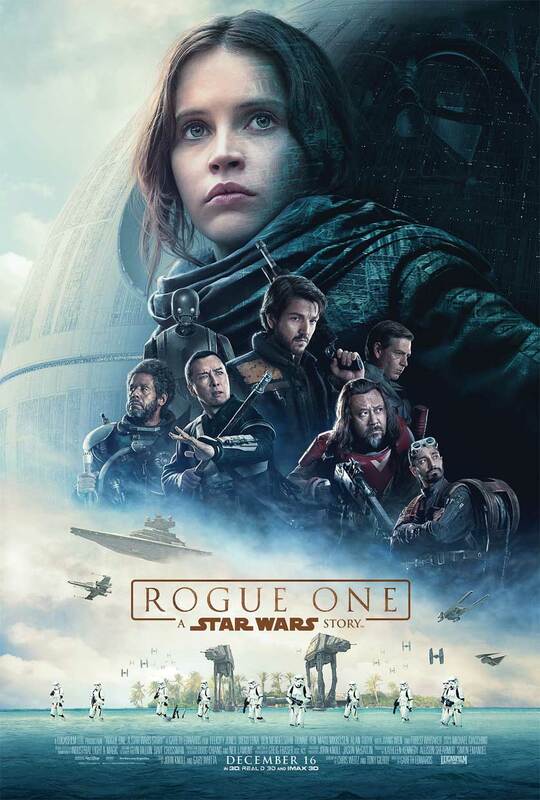 They recruit a criminal named Jyn Erso, to help them accomplish this mission. The movie was directed by Gareth Edwards (who also helmed the 2010 indie sci-fi hit 'MONSTERS', and the 2014 'GODZILLA' reboot); and it was written by Chris Weitz, Tony Gilroy, John Knoll and Gary Whitta. It stars Felicity Jones, Diego Luna, Ben Mendelsohn, Donnie Yen, Alan Tudyk, Jiang Wen, Riz Ahmed, Mads Mikkelsen, Forest Whitaker and the voice of James Earl Jones (once again reprising his iconic role of Darth Vader). The film has received mostly positive reviews from critics, and fans alike (including filmmaker Kevin Smith, and series creator George Lucas). I absolutely loved it! This is the prequel that fans have been waiting for; the film that many had hoped 'THE PHANTOM MENACE' would be (or at least one of it's two sequels), but this actually delivers (where George Lucas previously failed)! I'll admit it's not as fun as any of the other 'STAR WARS' movies, but it is epic (and pretty emotionally dramatic). It's a slow-building character driven drama (with lots of great action as well). The performances are all good, and the dialogue is well written (much like last year's 'THE FORCE AWAKENS'); it also doesn't have any of the lame silly kids' humor, that Lucas's prequels were filled with. There's even some great nostalgic throwback scenes (but it's not nearly as heavy on them as 'THE FORCE AWAKENS' is). Going into the film, I knew pretty much how it would all play out (as anyone that knows the earlier 'STAR WARS' movies, by heart, should); but I still loved watching it all unfold! It's a 'STAR WARS' film, and it's also it's own beautiful sci-fi tale; I cried (like I often do at movies that really move me like this). It's another 'STAR WARS' masterpiece!